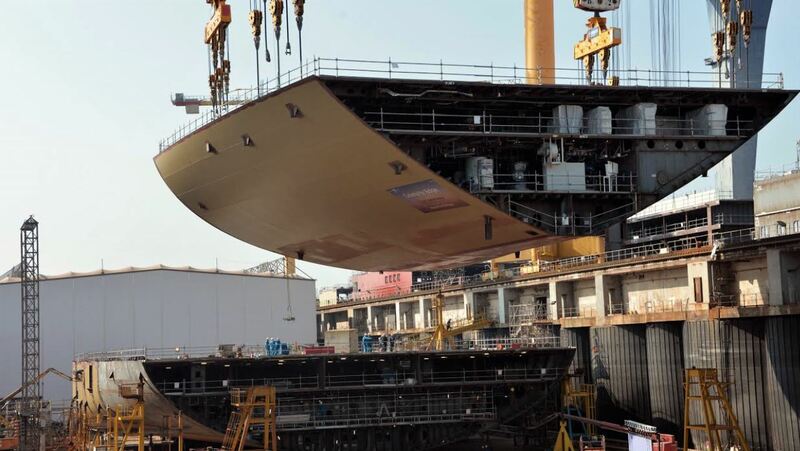 Six months ago the next generation of cruise ships for luxury cruise line Celebrity Cruises moved from concept to construction, as the first piece of steel for Celebrity Edge was cut at the STX France shipyard. Today marked another important step in the construction of Celebrity’s new flagship with the laying of the keel. 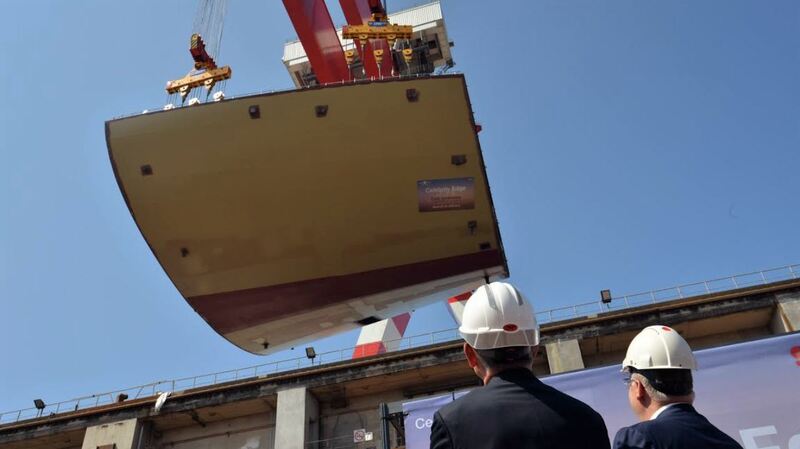 Less than a week from the next Celebrity Edge reveal, the first 875-ton keel block for Celebrity Edge was lowered into place at the Saint-Nazaire building dock. Before the block was lowered into position a tradional lucky coin was placed in the dock. With the solid foundation of Celebrity Edge now in place, the building blocks can be joined together to create the ship of the future. When the first ship in the new Edge Class comes into service in 2018 ten years will have past since the launch of the revolutionary Solstice Class, with its Lawn Club at sea, and it will be six years since Celebrity introduced Celebrity Reflection. 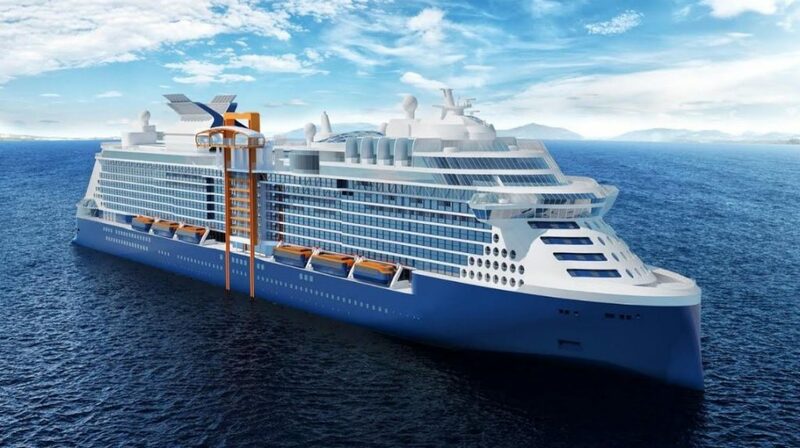 With the introduction of Celebrity Edge Celebrity Cruises is bringing some new and revolutionary design features to modern luxury cruising. The Edge Staterooms with Infinite Veranda will erase the boundaries between the traditional ship stateroom and its veranda, creating a closer connection to the ocean. Other innovative staterooms will include split-level Edge Villas. With two stories of windows that look out over the terrace, with its own private plunge pool, the unique design of these villas will seamlessly blend indoor and outdoor living. The Pool Deck onboard Celebrity Edge has been designed as an outward-facing asymmetrical space that makes ocean views and landscapes the focal point. At the center is a 25-yard lap pool with in-pool loungers. Two two-story martini hot tubs will take unwinding at sea to new heights. 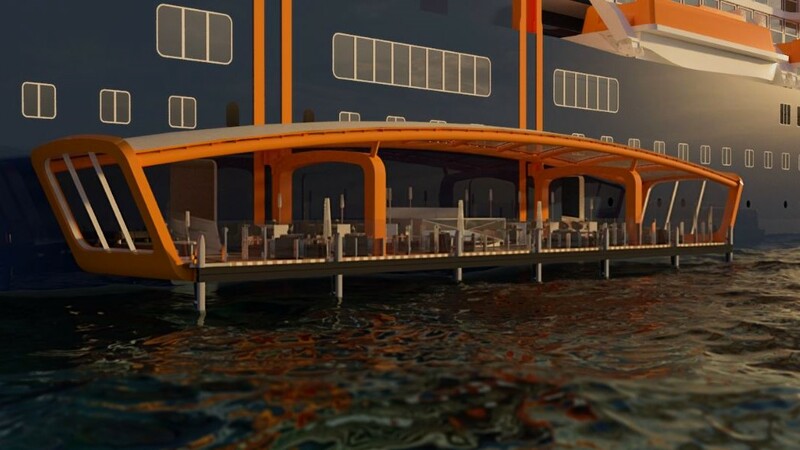 The main new design feature for Celebrity Edge will undoubtedly be the Magic Carpet. The size of a tennis court, this incredible engineering feature will scale the 16-deck ship through the day and evening, positioning at four of the ship’s decks, transforming into a new and exciting experience at each one. At its lowest position on Deck 2, Magic Carpet will be a key component to the Destination Gateway, a luxury embarkation station where guests will be whisked away aboard sleek Edge Launches. 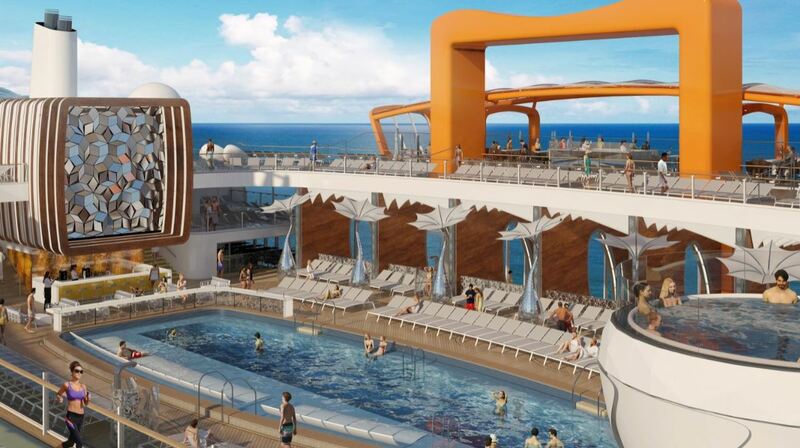 Celebrity Edge will be able to carry 2,900 guests in 1,450 staterooms and is expected for delivery in Fall 2018. The second Edge Class ship, Celebrity Beyond, is scheduled for delivery in Spring 2020, the third and fourth Edge Class ships in Fall 2021 and Fall 2022, respectively. The ship will homeport in Fort Lauderdale, FL., making her first sailing on December 16, 2018. Edge will sail two 7-night Caribbeanitineraries. An eastern Caribbean cruise visiting San Juan, Puerto Rico; Tortola, British Virgin Islands; and Philipsburg, St. Maarten. The western Caribbean will call on Key West, Florida; Costa Maya, Mexico; Cozumel, Mexico; and George Town, Grand Cayman.